Robert E. Lee on leadership: executive lessons in character, courage, and vision. · One Book. One Author. One Hour. Robert E. Lee on leadership: executive lessons in character, courage, and vision. Notes on front endpapers and back free endpaper: The Rebell [i.e. Rebel Yell] yell. Dies Oct 12, 1870. Stonewall Jackson (199), A.P. Hill, JEB Stuart, James Longstreet. 1. Son/Rob; 2. Son/Rooney (POW); 3. Son/Custer; 4. Daughter/Mildred; 5. Daughter/Annie. Since war began lost a child, 2 grandchildren, a daughter-in-law, a crippled wife. Custis' loss at Syalor's Creek p 152. Lee was a student of “great men”: Napoleon, George Washington, “the imitation of Christ.” Wed July 14 230 p. Son-no fiction p 15. How much combat did he see? Why do you call it the War between the States? Hayek--command economics “Road to Serfdom.” Blackman at St. Pauls with Lee went to communion. Today's leaders p 194 vs. Lee. He never swore; had no slaves. No revolutionary, a conservative, opposed to violent change, lessons of Socrates, fatherless, Brother (older) Smith, indefatigable, loved rather than feared p 41, humility p 57. [Great turning pt.--p 81, McClellan sees Lee's Special Orders No. 191]. Today's leaders vs. Lee p 194. Chancellorsville--biggest triumph of war, paid enormous price--Stonewall Jackson's death. Grant's war of attribution--in a month 1864 lost 50,000 men p 139. Grant's strategy of attrition worked. Carpe diem--seize the day. Notes/underlinings: Details on Lee's family/personal life, price of war, reputation, influence, leadership. Purpose of book. Education, religion, self-discipline, career, consequences. Lamb underlines sections in each of the Lee's lessons section. 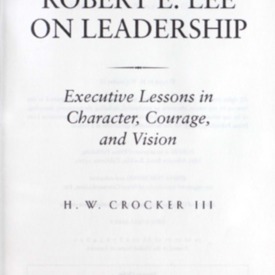 Crocker, H. W., “Robert E. Lee on leadership: executive lessons in character, courage, and vision.,” One Book. One Author. One Hour., accessed April 19, 2019, http://booknotes.gmu.edu/items/show/728. H.W. Crocker's work describing General Robert E; Lee's skills as a leader. "Lee, Robert E. (Robert Edward), 1807-1870--Military leadership."